Raven Rebel, as he's often called, was a wild horse lived once far away in the fields of Comet, a land so beautiful, so wonderful, where gorgeous wild horses roamed the lands. That is why they called it Comet. Raven lived in a small herd with his mare, Coldwhisper, a beautiful white Andalusian, and his two fillies, Hazelnut, a shy bay Warlander, and Silvermist, a brave gray Warlander. 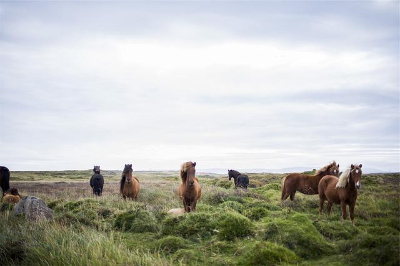 The four horses would always roam around the land, and they would always protect each other from selfish humans that would do anything to capture one of these horses and send them to slaughter. But some people protected this herd, and they would call it "The Fours". Raven Rebel and his heard found themselves in a empty field with no horses, no flowers, no nothing. Just grass. "Is this in the fields of Comet? Raven asked Coldwhisper. "I don't think so.. It doesn't look like it, if it were from Comet, there would be horses everywhere." She answered. Raven sighed. "True..." Hazelnut and Silvermist looked at Coldwhisper curiously. "So what is this place then?" Silvermist asked. Hazelnut remained silent. "I don't know, sweetie.." She replied. "But hopefully, we will get out. It seems dangerous." Silvermist's shocked face turned into a playful smirk, and then looked at Hazelnut. "Hah! Nothing is dangerous to me! PLUS, danger is MY middle name!" Silvermist exclaimed, playfully. Hazelnut rolled her eyes. "Thats new." She said. Raven laughed a bit. "Silly Silvermist." He chuckled. Just then, a loud roar was heard from a forest nearby, which sounded something like a big cat. And then suddenly, a jaguar came out of no where, and pounced on Raven Rebel. Next Part: Not out yet.